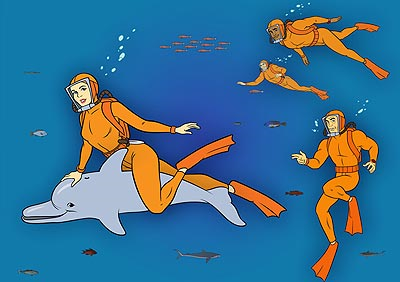 She's Fantastic: Sealab 2021's DEBBIE DUPREE! I have never been a big fan of Cartoon Network's Adult Swim programming. Irreverent humor just isn't my thing. That said, I love the fact that shows like Harvey Birdman, Space Ghost Coast to Coast, and Sealab 2021 exist because they breathe new life into the kind of classic cartoons that I love. Without the goofy antics of this late-night programming, we would never ever ever be getting toys of these classic Hanna-Barbera characters. For those uninitiated, shows like Sealab 2021 take original animation (in this case, from Hanna-Barbera's 1972 sleeper hit, Sealab 2020) and repurpose it into comical nonsense by means of splicing, dubbing, and adding new animation. My brothers love this stuff, but it just isn't my cup of tea. Sealab 2020 was an underwater adventure series reminiscent of Star Trek. 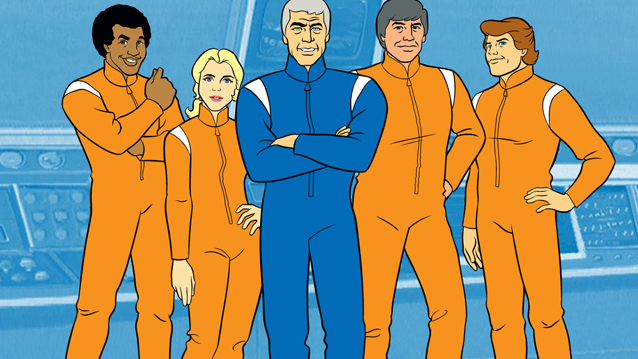 Sealab 2021 was a parody of that same setup, but set 1 year later when all the characters were getting lax with their underwater responsibilities. Debbie Dupree is actually the character Gail from the original show. Debbie Dupree comes in a giant two-pack with Dr. Quentin Q. Quinn. Interesting note: I'm 99% sure the Series 2 figures shown on the packaging were never produced. The great thing about all the Adult Swim toys is that when stripped of all their nonsensical accessories and set pieces, the figures are perfect representations of their classic counterparts (the Toycom Space Ghost Coast-to-Coast series is a prime example of this). The sculpt by Big Chief Studios is perfect. The classic animated look can be very hard to capture in 3-D, but this hits the nail on the head. They came with a ton of accessories including a Dolphin, 2 Figure Stands, 3 Bottles of Booze, a Beer Can, a Whiskey Glass, an Alarm Clock, a Freestanding Computer Monitor, and some purple thing that I assume is an underwater propulsion device or camera. The Dolphin (named Tuffy in the original cartoon) is made of a flexible rubbery plastic. Debbie is articulated at the neck, shoulders, elbows, wrists, waist, and upper legs - giving her a total of 10 POA.